Working during college is a great way to start testing the waters of a professional environment and beef up your resume a bit. A part-time job may be unrelated to a specific major, but students will learn transferable skills desired by employers, including time management, communication, teamwork, leadership, and problem solving. 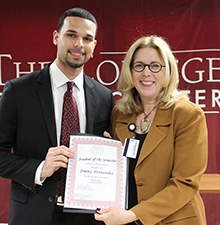 Congratulations to Day Student of Semester, Jimmy Hernandez! Jimmy is currently enrolled in the Accounting program with a 3.90 GPA, having earned Dean’s List recognition. He currently works at the Gap in the Westchester Mall and is co-President of the CW business club Enactus. Once Jimmy completes his associate’s degree in December, he plans on continuing with his BBA here at CW. Jimmy’s career goals include becoming an accountant and investing in real estate, as well as working as a real estate agent.